When fallen beauty Daphne, Lady Faville, is carried to safety from a rampaging fire, she's horrified to recognize her rescuer as Hugh Westleigh—a man with every reason to despise her! Daphne, Lady Faville, jolted awake at her maid’s cries. Smoke filled her nostrils and stung her eyes. Shouts and pounding on doors sounded in the hallway of the Ramsgate inn. “Fire! Get out,” a man’s voice boomed. Daphne leaped out of bed and shoved her feet into slippers. Her maid began gathering their belongings, stuffing them into a portmanteau. She reached for the door latch, but her maid pulled her arm away. “Wait! The hall may be on fire.” The maid pressed her hand against the door. “It is not hot. It is safe.” She opened the door. The hallway was filled with smoke, and tongues of flame licked the walls here and there, as if sneaking up from below. In a moment the wallpaper would curl and burn. The fire would grow. It could engulf them. Daphne saw a vision of another time, another fire. Her heart pounded. Was she to die in flames after all? “Keep your skirts away from the fire,” she cried to Monette. They moved blindly ahead, down the long hallway, through its fiery gauntlet. “Hurry, Monette.” She took the maid’s hand and lamented asking the innkeeper for rooms that were as private as possible. Their rooms were far from the stairway. “Someone is in the hallway. At the end,” a man’s voice cried. Through the grey smoke he emerged, an apparition rushing towards them. He grabbed them both and half-carried them through the hallway past other men who were knocking on doors, and other residents, emerging in nightclothes. They reached the stairway and he pushed Monette forwards. The girl ran down the stairs. Daphne shrank back. The flames below were larger, more dangerous. “I’ll get you through.” The man gathered her up in his arms and carried her down the three flights of stairs. She buried her face in his chest, too afraid to see the fire so close. Suddenly the air cooled and she could breathe again. They were outside. He set her down and her maid ran to her, hugging her in relief. They were alive! Daphne swung back to thank the man who rescued them. He was already running back into the fire. He brought them to where a group of people in various stages of undress huddled together. “I must go back to the buckets, my lady.” He looked apologetic. He ran to the brigade passing buckets of water to the fire. Other men led horses out of the stables and rolled coaches away from the burning building. Daphne’s eyes riveted on the doorway, willing their rescuer to reappear. Other men carried people out, but she did not see him. She’d not seen his face, but she knew she would recognize him. Tall, dark-haired, and strong. He wore the dark coat and fawn pantaloons of a gentleman. Finally he appeared, two children tucked under his arms and a frantic mother following behind. Daphne took a step forwards, eager to speak to him, to thank him. To her shock, he ran towards the door again. One of the other men seized his arm, apparently trying to stop him, but the man shrugged him off and rushed back inside. Daphne’s hand flew over her mouth. Please, God, let him come out again. She wanted to watch for her rescuer, not engage in conversation. It was a place she wanted to forget, the London gambling house where players could gamble in masks to protect their identity. It was also the place she almost destroyed. It was inadequate as an apology. Surely he—and everyone—knew that she’d been obsessed by only one man, a man who would never love her. She’d fled to the Continent and eventually to Switzerland to Fahr Abbey. The abbey became her retreat and her salvation, chosen by whim because its name was similar to her husband’s title name and the name of the village where she’d once felt secure. At Fahr Abbey, though, she’d come face to face with her failings. Could she be as selfless as her brave rescuer? Minutes seemed like hours, but he finally emerged again, leading two more people to safety. The fire intensified, roaring now like a wild beast. Were there more people inside? Would he risk his life again? He ran back to the fire and was silhouetted inside the doorway when a huge rush of glowing embers fell from the ceiling. The building groaned, as if in the throes of death. Timbers fell from the roof and the man’s arms rose in front of his face. Daphne watched in horror as one large flaming timber knocked him to the floor. “No!” Without thinking, she ran towards him. Other men reached him first, pulling him by his clothing until he was in the yard. The building collapsed entirely. Daphne knelt down next to him as they brushed away glowing cinders from his coat and patted out smoking cloth. “Is he alive?” she cried. Though his face was dark with soot and pink with burns, she recognized him. He was Hugh Westleigh, younger brother of the new Earl Westleigh. He was also the brother of the lady she’d so terribly wronged at the Masquerade Club. Had he arrived on the packet from Calais, as she had? Or was he bound there? Either way, she suspected he would not have liked seeing her after all the trouble she’d caused. He was not conscious, and that alarmed her. “We’d better carry him to the surgeon,” one of the men said. They lifted him. Daphne followed them. 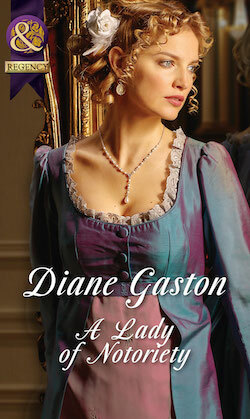 A Lady of Notoriety was a finalist for Best Historical in NJRW’s 2015 Golden Leaf Contest. CataRomance named A Lady of Notoriety one of their best of 2014 in their Reviewers Choice Awards. A Lady of Notoriety is a book about redemption. Daphne, Lady Faville, was the villainess of A Marriage of Notoriety, the cause of all bad things happening in that story. Daphne was incredibly beautiful, immensely wealthy, and was that most independent of Regency women–a widow. Her whole life she’d gotten whatever she wanted because of her beauty. She was self-centered, lacked insight, and had little emotional depth. So why did I select her for my heroine? Because I believed she could be redeemed. I believe that anyone can change. In fact, I based a whole career on that belief. Before I started writing Regency Historical Romance, I was a mental health social worker, a psychotherapist. For the first half of my career I worked with children and their families; in the second half, I was a psychotherapist for senior adults (those over 65). A psychotherapist helps facilitate change by providing emotional support, showing different ways of viewing a problem, promoting awareness and insight into how a behavior brings about a certain result. I truly believe a good psychotherapist can be of immense help to people in emotional pain, people who need to change in some way, but a therapist is not essential. Psychologists Prochaska and DiClemente developed a way of describing the stages of change. This stage is where we’ve never thought of change. I think of it as “pre-awareness.” In A Marriage of Notoriety, Daphne thinks nothing she does is wrong. In her life, things have always worked out for her and people have catered to her because of her beauty. The idea that she should change would never enter her mind. She’s quite happy with herself. We can’t change if we don’t see a need to change. Then something happens that makes us aware that we should change. Something shakes our status quo and the idea that we ought to be doing something differently becomes clear. This can be a sudden, dramatic event, like Daphne experiences at the end of A Marriage of Notoriety, or it may dawn on us more gradually, like a friend who finally realizes she always picks men who are rotten to her. Awareness of the problem is essential. At this stage, though, we also are faced with all the ways it would be hard to change, and all the excuses we can come up with about why it is impossible. How many times have we said something like, “I want to lose weight, but I can’t give up ice cream.” Still, we know we need to give up that ice cream (or give up eating the whole gallon in one sitting). Daphne comes to this awareness while in a nunnery in Switzerland. This stage involves the actual decision to change, becoming determined to change. This is a stage of learning and of mental rehearsal. We learn about what we need to do to change. We develop a strategy of how to go about it. Daphne learns how to change in the nunnery. Finally, we begin to practice . Daphne is at this stage at the beginning of A Lady of Notoriety. She is determined to return to England and live life differently. The challenge in this stage is continuing to behave differently. This is the most difficult part of change, because it is so easy to fall back into old behavior patterns, especially when things are seeming to not work out. Daphne makes mistakes, falls back into old patterns, but ultimately continues to strive to maintain her new behavior habits, mostly because she likes herself better. The positive outcome of behavior change keeps motivating us to continue. These stages of change aren’t confined to emotional issues. They apply to serious matters like addiction, but also weight loss, better health habits, even something tiny like trying new foods. For Daphne, her decision to change transforms her life and leads to achieving her happily ever after. I didn’t research change before writing the book. I didn’t even think of doing that. I simply wanted to tell Daphne’s story and to face situations through her eyes. This was one of my favorite books to write and I hope readers enjoy Daphne’s journey as much as I did.